What’s the worst part of your job? The part that requires you to be tough, sometimes even heartless? That can trigger multimillion-dollar legal nightmares? That never goes away? It’s the performance review. Your HR staff and managers must administer it, once a year, to every employee. When it’s administered ineptly – and that happens all the time – you pay with staff and productivity headaches. And when it goes totally off the rails (that happens, too), we’re talking Lawsuit City. If there’s anything worse, I’d like to know what it is. Because the hard truth is, performance reviews are just … difficult. In the hands of a softie, they lead to keeping deadwood on staff, while in the hands of an SOB, they can darn well get everyone sued – your organization, the people who work for you … and you yourself. It would be so great to get this headache under control … ease your management burden … free yourself to concentrate on things that really matter. And you can – for a price far lower than you might imagine. Spend the next 4 minutes and 41 seconds reading this … and discover how. 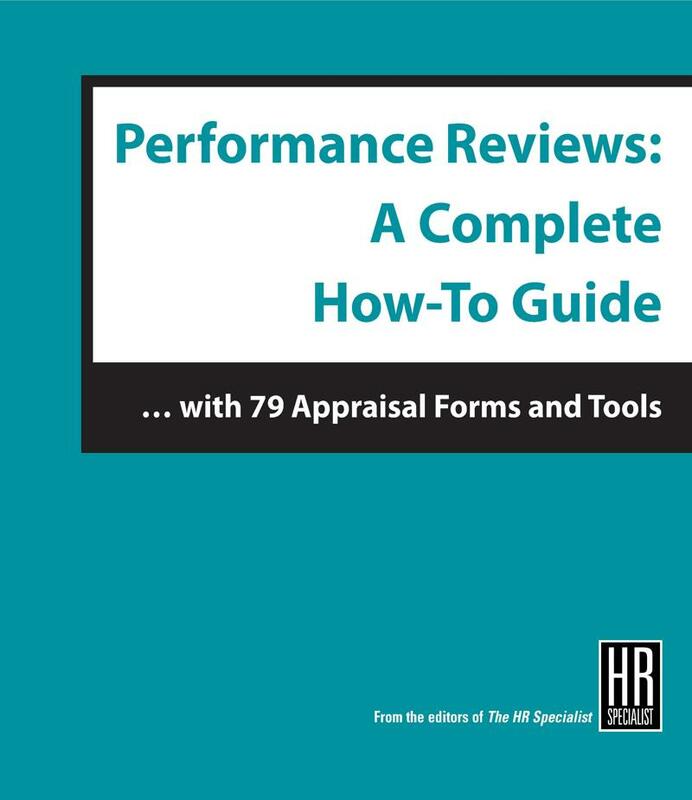 Buy Performance Reviews: A Complete How-To Guide Today! Yes! I’m ready to face new challenges with this expert advice. And, icing on the cake, lawyer-tested cases and counsel. The termination tactic that almost GUARANTEES a lawsuit. Making the termination experience unnecessarily unpleasant. Courts and juries consistently come down on HR officials who commit this blunder. And even if you win in court, you lose, because defending against a claim takes tons of money and time. The thing NEVER to say in a warning letter. Don’t let HR people breathe a word about restrictions on how well the employee will be rated at evaluation time, especially if a bonus depends on the rating. A court held that such a restriction amounts to an adverse action (Goldfaden v. Wyeth Laboratories). When good reviews aren’t good enough. Courts often side with fired employees who can show years of positive reviews. Great way for HR to fight back: Show the firing had a legitimate business reason (Nemec v. Wal-Mart). This is the sort of thing every HR person needs to know every time he or she conducts a performance review. The sort of thing you probably didn’t know because it’s not in your wheelhouse. That’s why Performance Reviews: A Complete How-To Guide is such a lifesaver … for you. Let’s start with those forms. Those precious forms. There’s one for almost every situation HR managers face. Download them with a click or two, that’s how convenient they are. Modify them however your HR staff sees fit. The amount of time and effort these forms will save – by themselves – will repay the cost of Performance Reviews: A Complete How-To Guide many, many times over. The next time-and-effort-saver? The 14 audits you find within the covers of this fat three-ring binder. HR staff exists to help you get the most from every employee. These audits make that happen. An employee is fired for dishonesty but protests that her strong work record should override the decision. What YOUR people should do: Be sure discipline records show company policy was followed … avoid using a parental tone but don’t sugarcoat their words … and document, document, document. Someone asks to check an employee’s work. The employee blows his top. What YOUR people should do: Check his workload (maybe he’s overburdened) … remind others that manners matter … and put up posters for de-stressers such as meditation and yoga classes. Even if employees don’t sign up, they’ll get the message that HR cares. You have a complainer on your hands. What YOUR people should do: Consider adopting a “negativity” policy. Most employers never think of this, but Performance Reviews: A Complete How-to Guide even includes a sample policy. See, we understand what you need to get the most from your staff. We ought to. We’ve been at this a long time – 81 years to be exact – helping executives like you achieve career excellence and the rewards that follow. We know HR is one of the hottest potatoes on your plate, with issues that change every day. Gender discrimination, always a thorny one, gains force with the advent of #MeToo and #TimesUp … immigration policies that are the stuff of daily headlines trickle down into the workplace … and your workforce grows both younger and older at the same time. I think you see by now how Performance Reviews: A Complete How-To Guide can help you get more out of your HR staff … and simplify your life in the bargain. But – I’m just guessing here – perhaps you’re also thinking that something this valuable could set you back a pretty penny. Well, depends what you call a “pretty penny.” How does this sound? Skim the table of contents. Flip to an issue that bedevils HR folks. The solution found there will be appropriate. I GUARANTEE IT. If I’m off base, it’s on me. Put Performance Reviews: A Complete How-To Guide back in the box and return it at my expense. I’ll wipe the charge from your account – 100% of your money back – and never even ask for an explanation. We stand by our products and services without hesitation and without limits. That’s how certain we are that you’ll discover value in Performance Reviews: A Complete How-To Guide worth many, many times what you paid. But this low $127 price is available only to readers of this page and may be withdrawn at any time. It pays to ORDER NOW. You’ve wanted to be a leader, and now you are one, with the perks and pay that come with the job … and the headaches, too. You can choose to suffer in silence or … do something about them. You’ll be arming HR staff with forms and audits they’d spend hours searching for in filing cabinets or on the Web … providing them with tips and advice that have helped other HR professionals deal with the stickiest situations … and supporting them with legal backup that could save your organization tens of thousands of dollars in legal fees, not to mention avert legal disasters that can cost in the millions. And then there’s that NO-RISK GUARANTEE. That means you cover your exposed part. You know what to do, so do it. Order now. P.S. At the risk of repeating myself, allow me to reiterate our company-wide, all-products-all-services, air-tight guarantee. Here it is. Put the tips and advice to work. Performance Reviews: A Complete How-To Guide will quickly become the go-to reference every time HR staffers embark on a review. If they’re not satisfied – if you’re not satisfied – just return the materials and request a FULL REFUND. I’ll credit your card with every cent you paid.